The rompers bottom edges and necklines are finished with self fabric binding and a snap closure at the crotch. View A overlaps at the shoulders and has short sleeves. View B has long sleeves, a round neckline, a slit at the center back and optional eyelet trim on the neckline. 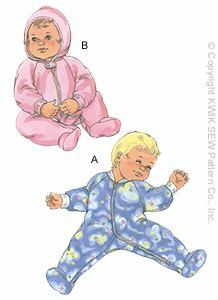 The jumpsuits have long sleeves, snap closures on the front and inside legs, and the neckline is finished with a self fabric binding. View C has feet. View D has ribbing cuffs. The cap has a fold-up cuff. The booties have ribbing cuffs. 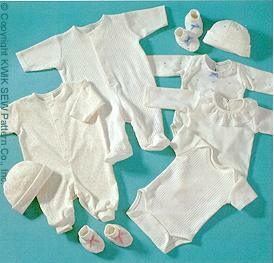 The Baby Rompers, Jumpsuits, Cap & Booties are designed for stretch knits only with 25% stretch across the grain. We suggest interlock, stretch terry or velour. 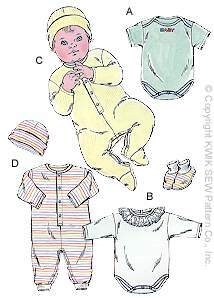 Sizes XSmall - XLarge included in one pattern.